A swimming pool fence is placed around swimming pools to create a passive barrier that restricts the access of small children to the swimming pool. Swimming pool fences must have a self-closing and self-latching gate to be compliant to each county laws and codes. Swimming pool fences are designed so that young children cannot climb over them or go through them. They are manufactured to strict standards to be sturdy, durable and non-climbable. 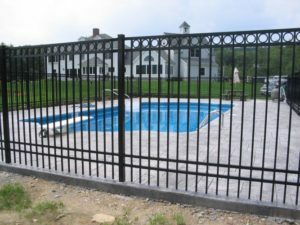 Cornerstone Fence and Ornamental Gate of Connecticut manufactures swimming pool fences in several different types, using a variety of materials. The Association of Pool & Spa Professionals has developed a model barrier code for residential swimming pools, spas, and hot tubs; this code has been approved by the American National Standards Institute. The spacing between pickets must be less than 4 inches. The space between the bottom horizontal rail and the ground must be less than 2 inches. The gate(s) must be self-closing and self-latching. The gate(s) need to open outward (away from the pool area). The operating mechanism of the latch must be at least 54 inches from the bottom of the gate or it shall be on the pool side of the gate at least 3 inches below the top AND shall not have any opening greater than 1/2 inch within 18 inches of the release mechanism. Cornerstone Fence and Ornamental Gate of Connecticut is a family owned and operated, full service fence contractor, based in Meriden CT. We have been proudly serving the states of Connecticut, Massachusetts, New York and Rhode Island for over thirty years. We take pride in the efficiency of our work; as well as, our premium service. Contact us today to learn more about your swimming pool fence project.